PRONTO PLAN - 3 Recipes per week for 2 or 4 people. As low as $11.67 per meal. VEGGIE PLAN - 3 Recipes per week for 2 people. $12.33 per meal. Our Veggie Plan involves an abundance of seasonal produce, hearty grains, and vegetarian friendly proteins. It's specially designed with our vegetarian friends in mind, although we have a feeling even the most loyal meat-lovers will fall in love with the wide variety of creative and flavorful recipes. 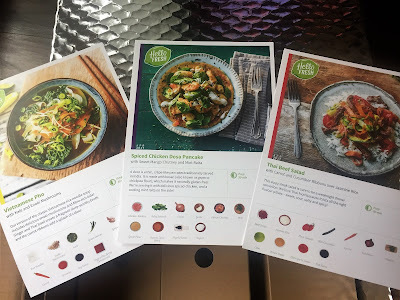 FAMILY PLAN - 3 Recipes per week for 4 people. $10.83 per meal. Our Family Plan was created with the whole squad in mind. 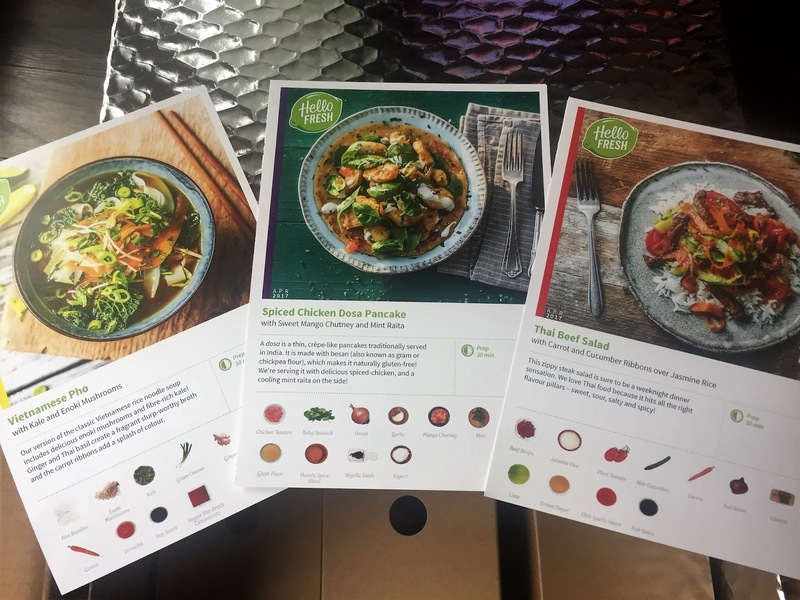 We hold back on the spice without skimping on flavour or nutrition for recipes that kids and adults will love to eat (even those picky eaters!). 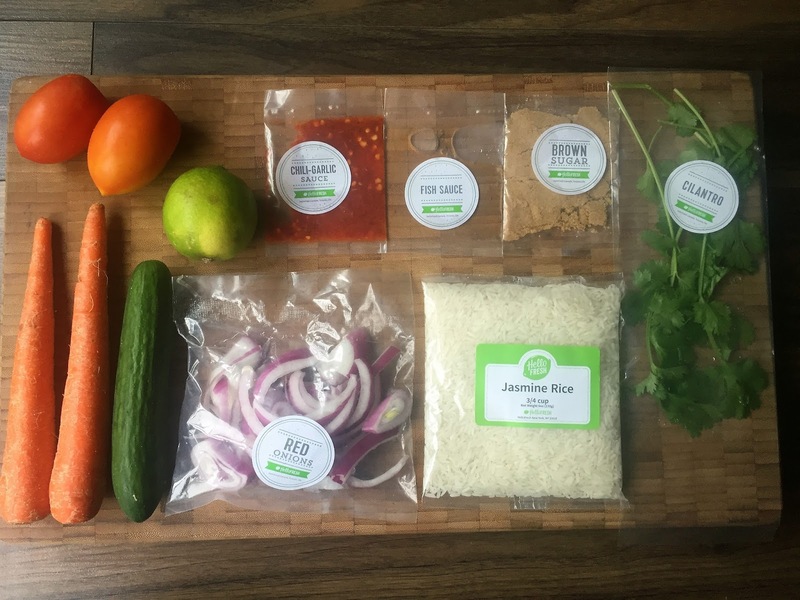 We make dinner time easy by taking care of the meal planning and grocery shopping so you can spend more time with your family, knowing that dinner will be delicious and nutritious. This is a review for the Pronto Plan for 2 people. It costs $79.99 per week, but I received a $50 promo for my first order. Keep reading to the end and you can get the same discount! The box shipped Purolator overnight from Edmonton and arrived to my home in the Greater Vancouver area the next morning. 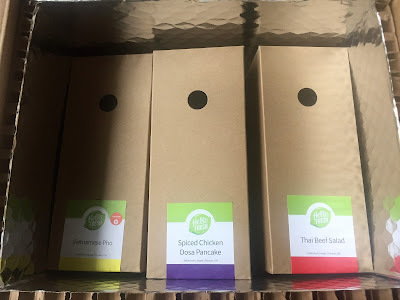 Like other meal boxes I've reviewed, the box has an insulated liner and ice packs to keep food fresh. 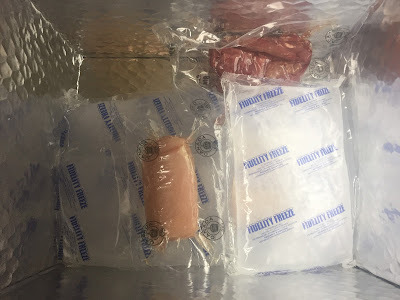 Everything is recyclable, including the nontoxic salt-solution ice packs. They also have an ice-pack return program! 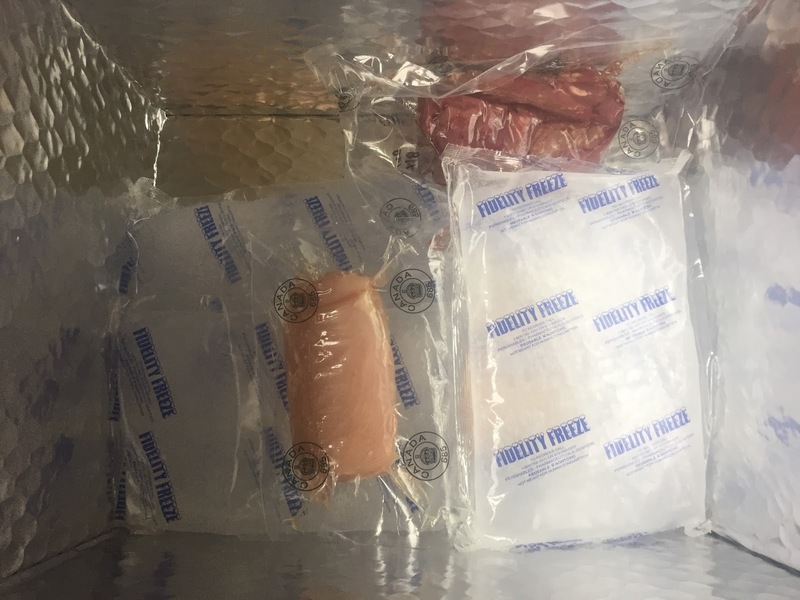 Save up 3-4 weeks of ice packs, then pack them into a box. 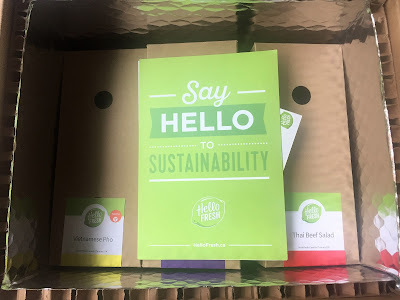 Contact Hello Fresh and they will arrange free pickup and shipping! Read here to learn more about Hello Fresh's packaging and recycling options. The first thing I noticed when I signed up is the lack of recipe variety each week. The Pronto Plan and Family Plan only offer 4 recipe options per week. The Veggie Plan only provides 3 recipes. Login to your account by Wednesday the week prior to delivery to see the meals and make any changes. Click here to see the Hello Fresh recipe archive to get an idea of what kind of recipes you can expect. 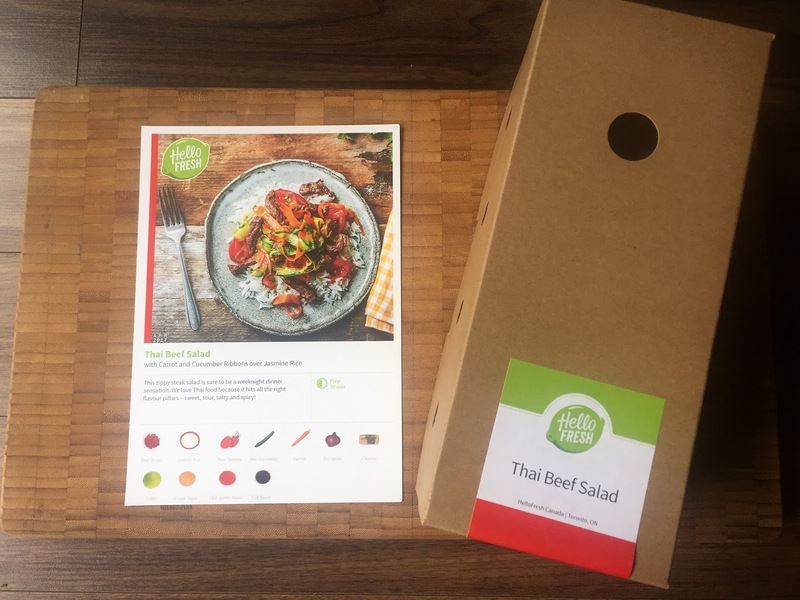 The Pronto Plan recipes for the first week of May were Vietnamese Pho, Spiced Chicken Dosa Pancake, Thai Beef Salad, and Double-Smoked Bacon Fusilli. I opted for the first three. 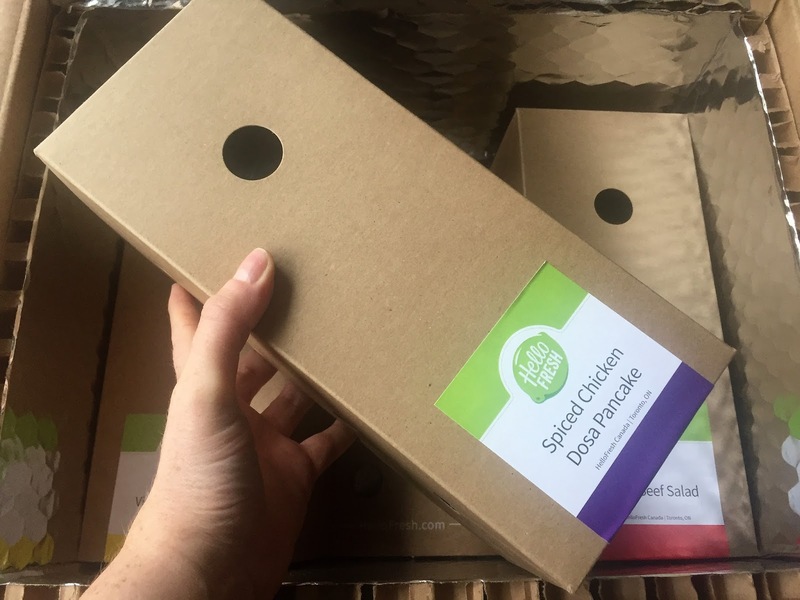 Instead of bags or loose ingredients, the products for each recipe come packed in these slim vented cardboard boxes. Genius! I love this feature. Everything is packed neatly inside and ready for storage in the refrigerator. 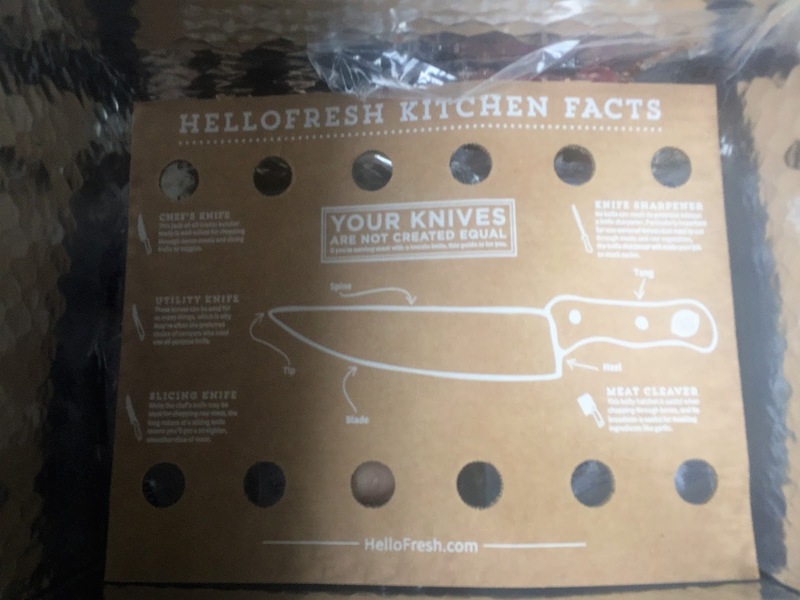 The cardboard separator is a great place for kitchen facts and tips! At the bottom we find the meat and gel ice packs. 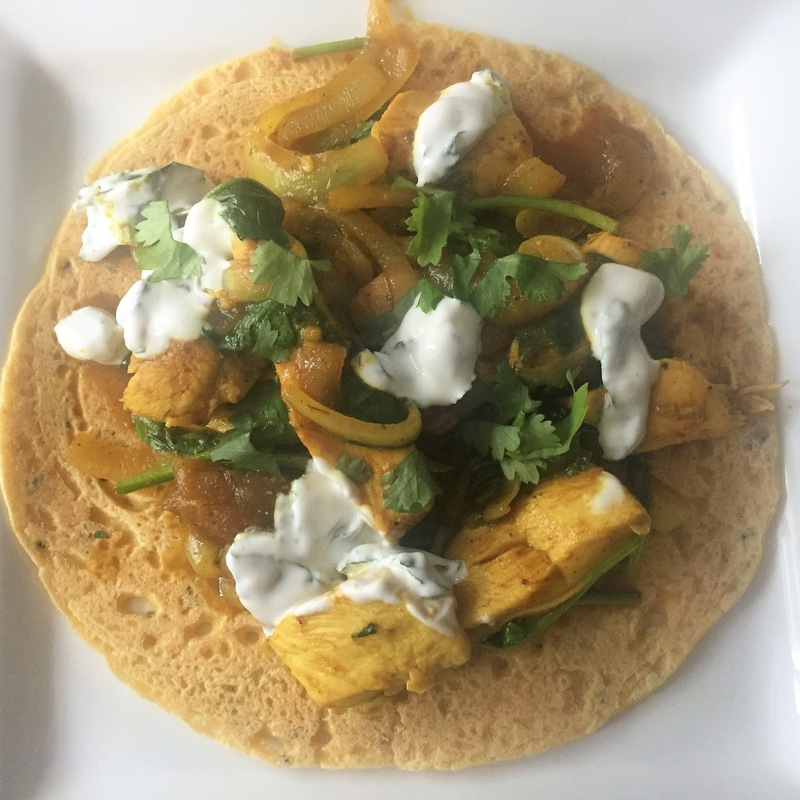 A note about the chicken this week - the Spicy Chicken Dosa Pancake recipe originally called for chicken tenders. 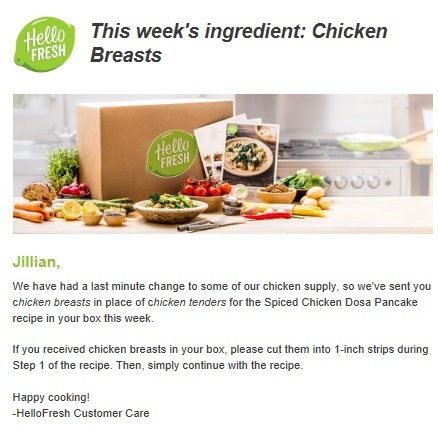 On May 1st, two days before shipping, I received an e-mail from Hello Fresh alerting me to a product change. They also included a note in the box. I found this communication fantastic. It's a sign of great customer service. This zippy steak salad is sure to be a weeknight dinner sensation. We love Thai food because it hits all the right flavour pillars - sweet, sour, salty and spicy! 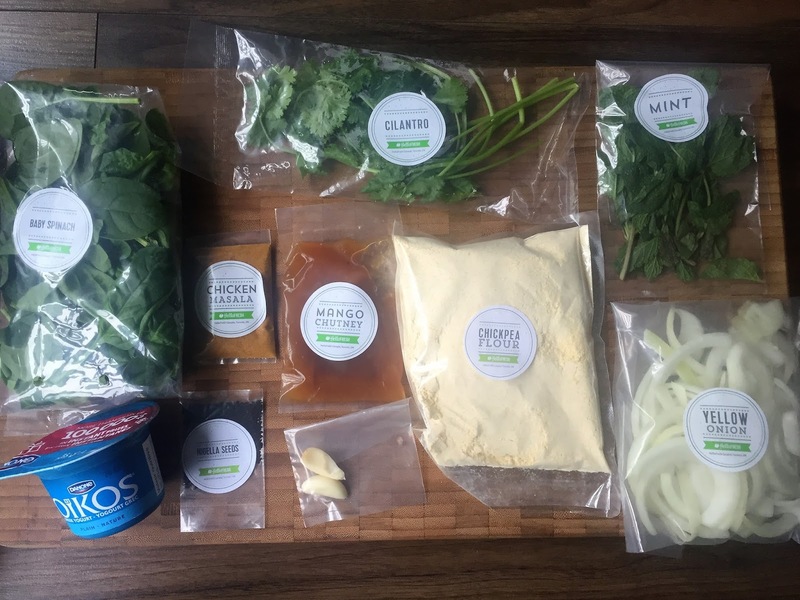 The ingredients are all pre-portioned and ready to go. Even the onions are pre-cut! This dish was a cross between a salad and a stir fry. 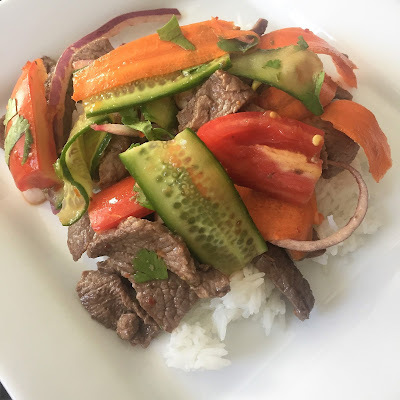 The beef is cooked but the veggies are served raw and simply tossed in a sweet chili garlic dressing. It was a refreshing dish, and a good option for warm days when you don't really want to cook. A dosa is a thin, crêpe-like pancakes traditionally served in India. It is made with besan (also known as gram or chickpea flour), which makes it naturally gluten-free! We're serving it with delicious spiced-chicken, and a cooling mint raita on the side! 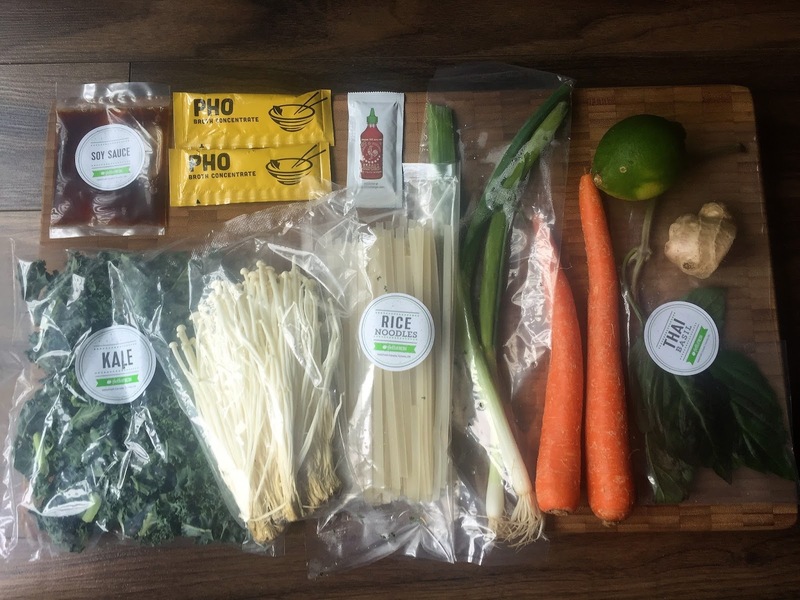 With Hello Fresh, even the liquids are packed in plastic bags instead of containers. The pancake is made with chickpea flour. The chicken was simmered with onions, masala spice, and chutney. For the raita, I mixed fresh chopped mint with plain Greek yogourt. It all came together quickly and made for a tasty, but very spicy, lunch! 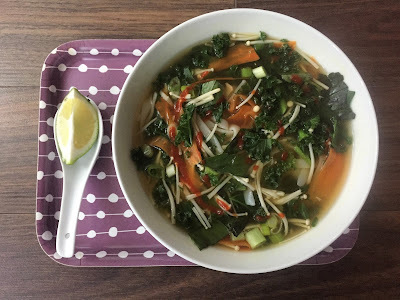 Our version of the classic Vietnamese rice noodle soup includes delicious enoki mushrooms and fibre-rich kale! Ginger and Thai basil create a fragrant slurp-worthy broth and the carrot ribbons add a splash of colour. The veggies were all very fresh. This recipe included curly kale, and it came all chopped up and ready to go. The Pho was the easiest and quickest to make. Who doesn't love a one pot meal? The broth ingredients were mixed together, then the veggies were added to the pot. That's pretty much it! This Pho was tasty, but I added way too much Sriracha! 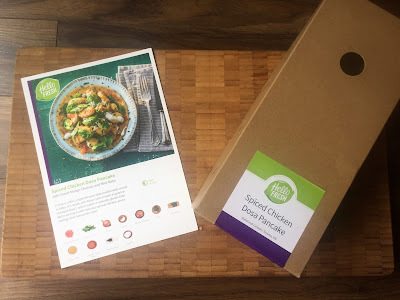 My first delicious adventure with Hello Fresh is done and I'm pretty pleased. 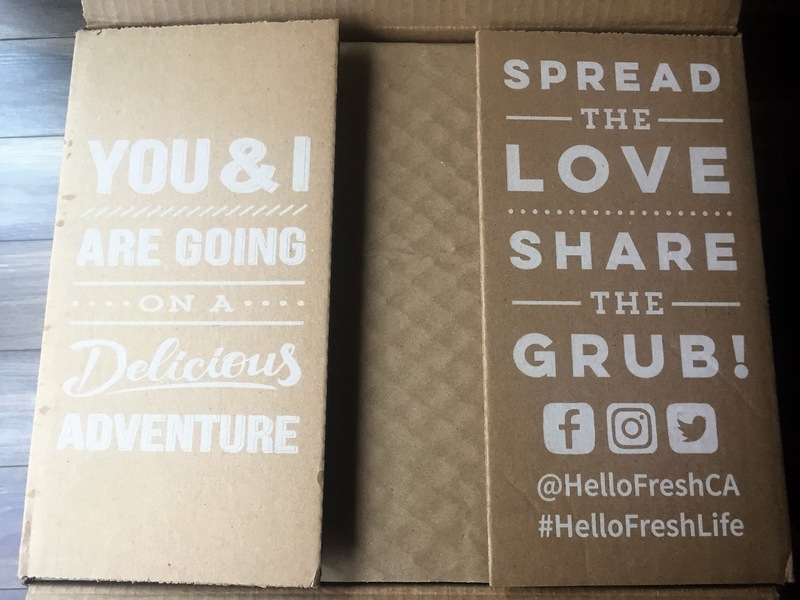 Here is a breakdown of what I liked, and what I didn't like about my Hello Fresh experience. 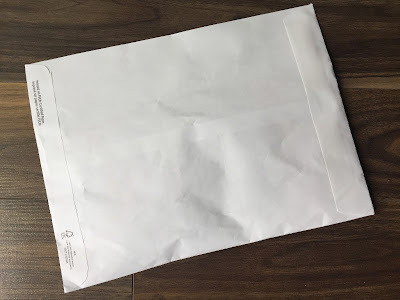 Plastic bags are heat sealed - no zipper lock. Scissors required! As you can see, the likes outweigh the dislikes, and the dislikes are not serious enough to deter me from trying Hello Fresh again. The meals I tried this week were quick and easy, fresh, and tasty. The recipes were clear and easy to follow. I was impressed enough that my next box ships May 16th! 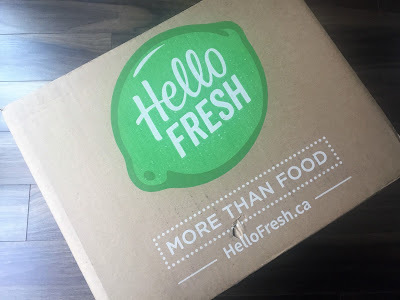 Interested in trying Hello Fresh Canada? 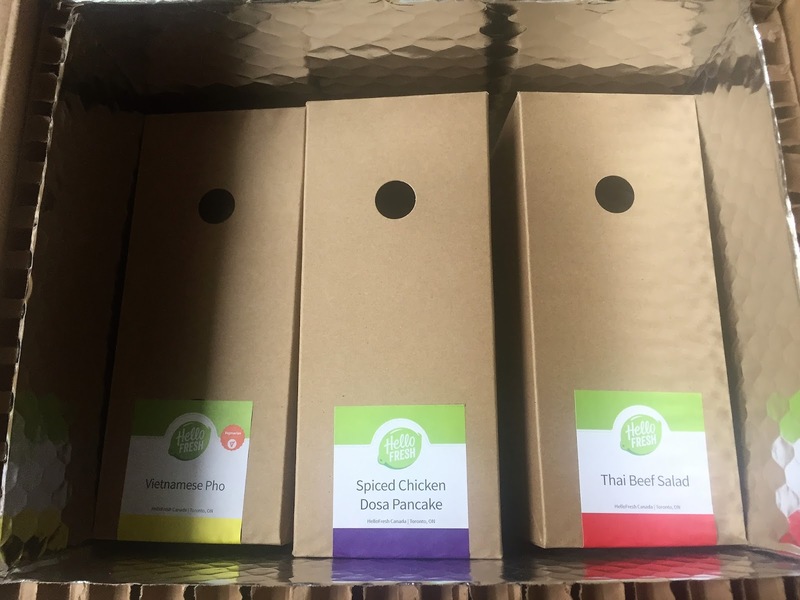 You can get 3 meals free with your first box using promo code CDNBOXADDICT. Code is valid until June 30, 2017. Click here to see what's upcoming on the Hello Fresh menu. Click here to check out Hello Fresh. Some nice fresh ingredients inside. 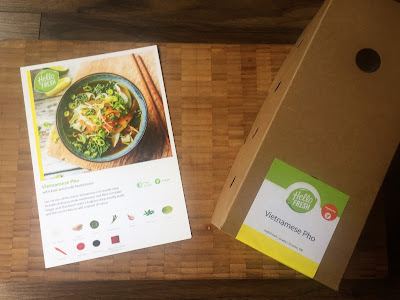 I have a terrible experience with Hellofresh this week! I expected to receive my order on Monday according to my weekly delivery plan. Usually, I got my meal box in the morning, but on Monday at 5 pm I haven't received anything. After my call to customer service, they assured me that delivery time is until 8 pm and nothing to worry. In an hour I have got the email from customer service which said "There appears to have been a mix-up at our production facility and your box for today was accidentally cancelled! " We agreed to change the delivery to Wednesday, May 16. As disappointed already a customer I expected to get my box as first thing in the morning on Wednesday, but it didn't happen. Even worse, I didn't receive my meal box even until 8 pm! After my call to customer service, the agent promised to follow up by email about the issue shortly. I didn't get any follow up email! And now the most interesting part! Today I have got the email from Hello fresh: "The courier left the box at your unit door, can you please check to see if the box is there?" So, I went and checked - there wasn't anything!!! I email back right away but anyone from Hallo fresh didn't contact me! However, they accurately charged money today for the next week meal!!! 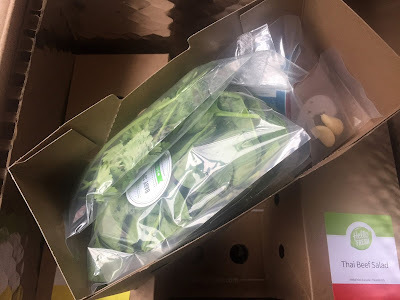 Hellofresh uses my money but didn't provide any product and service. I think they fool in this way not only me. I don't think I deserve to be upset all week about so disrespectful customer service. I would call their department Customer Disrespectful Care. 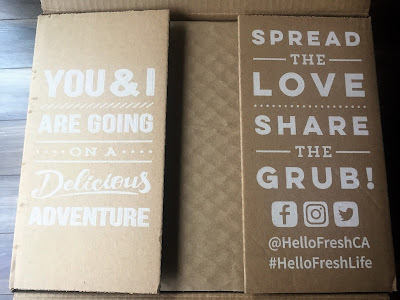 So, if you think to join Hello fresh, my advice is - don't waste your money, time and don't spoil your mood. That sounds like a frustrating experience. I can assure you, this isn't the norm with Hello Fresh. I have never experienced any of the problems you described after 2 years of on-and-off membership. 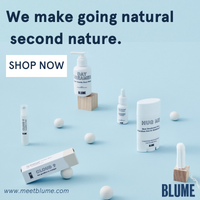 Cratejoy Mother's Day Flash Sale!